I love to create fun cookies to give and eat. When I saw this recipe for chocolate chip cookies that included M&M’s I had to get a Wilton Nonstick 12-Cavity Whoopie Pie Pan and try them myself. We love them. The pan creates a cookie that is bigger and thicker than ordinary cookies which makes them the perfect size to eat and give. Often I can’t stop myself at just one cookie but with this pan the cookie is bigger and I feel more satisfied. For the girls back to school swim parties I made these cookies. At first I was going to made them with all the colors but I decided to do different colors on each cookie. I love how they came out! 1. Preheat oven to 350 degrees. In your mixer beat the butter and sugars until well beaten. Beat in eggs and vanilla until well combined. Add flour, baking soda, baking powder and salt and mix. Add the chocolate chips. Save the M&M’s for later use. 2. Press dough and into a whoopie pan making sure to not overfill. 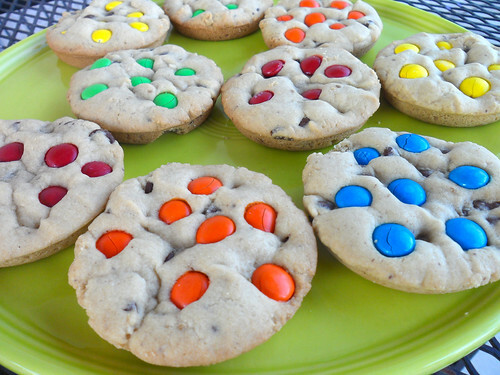 Push your M&M’s into pressed cookies. Bake for 9 minutes, until edges just start to turn golden brown. Let cool for 10 minutes in pan before transferring to a cooling rack.